Walking into a cell from an eighteenth century prison in Wellclose Sq was an especially vivid experience for me because – if I had lived then – I and almost everyone I know would have invariably ended up in here at some point. 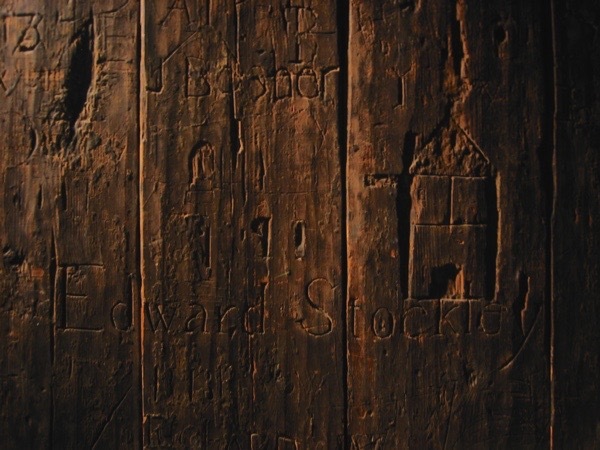 Although almost nothing is known of the occupants of this cell, they created their own remembrance through the graffiti they left upon the walls during the few years it was in use, between 1740-1760, and these humble inscriptions still recall their human presence after all this time. 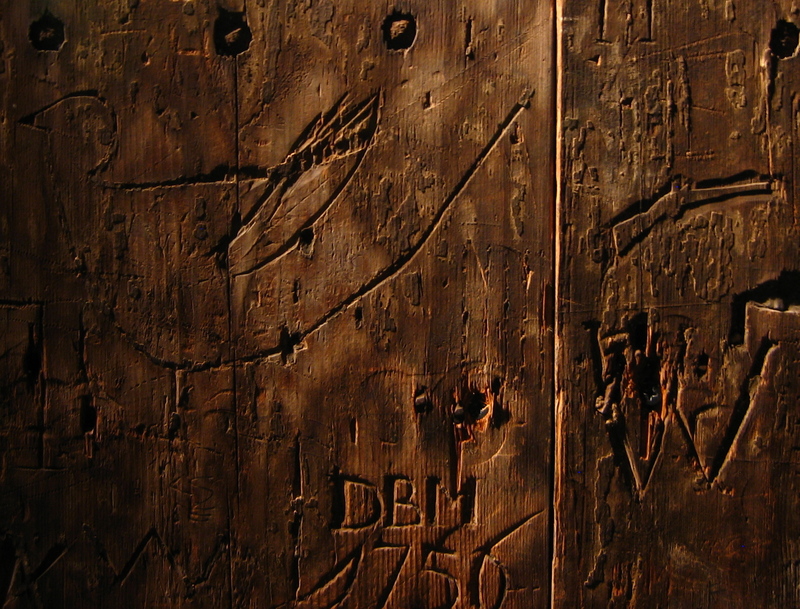 No one could fail to be touched by the emotional storm of marks across the walls. There are explicit names and dates carved with dignity and proportion, and there are dozens of crude yet affectionate images, presumably carved by those who could not write. There are also a few texts, which are heartbreaking in their bare language and plain sentiment, such as “Pray Remember the Poor Deptors.” The spelling of “deptors” after the model of “Deptford” is a particularly plangent detail. 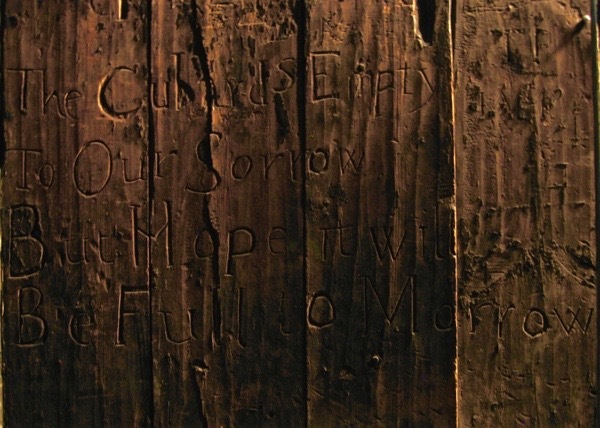 About six feet wide and ten feet long, with a narrow door in one corner, and lined with vertical oak planks, this is one of several cells that once existed beneath the Neptune public house. There is a small window with wide bars, high upon the end wall, corresponding with street level – not enough to offer a view, but just sufficient to indicate if it was daylight. There would have been straw on the floor and some rough furniture, maybe a table and chairs, where the inmates might eat whatever food they could afford to buy from the publican, because this was a privately-managed prison run for profit. Wellclose Sq was once a fine square between Cable St and the Highway, which barely exists any more. St Peter’s School, with its gleaming golden ship as a weathervane, is the only building of note today, though early photographs reveal that many distinguished buildings once lined Wellclose Sq, including the Danish Embassy, conveniently situated for the docks. When the Neptune was demolished in 1912, two of the cells were acquired by the Museum of London, where I was able to walk into one to meet Alex Werner the curator responsible for putting it on display. 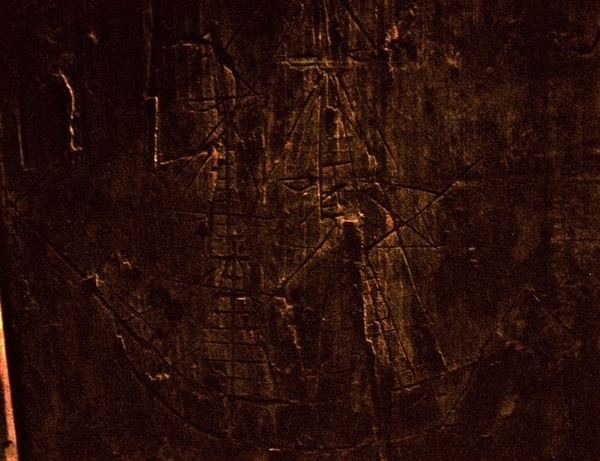 “We’re never going to know who they are!” he said with a cool grin, extending his arms to indicate all the names and pictures that people once carved with so much expense of effort, under such grim conditions, to console themselves by making their mark. It is a room full of sadness, and even as I was taking my photographs, visitors to the museum came and went but did not linger. In spite of their exclamations of wonder at the general effect of all the graffiti, people did not wish to examine the details too closely. The lighting in the museum approximates to candlelight, highlighted some areas and leaving others in gloom, so I took along a flashlight to examine every detail and pay due reverence to the souls who whiled away long nights and days upon these inscriptions. In a dark corner near the floor, I found this, painstaking lettered in well-formed capitals, which I copied into my notebook, “All You That on This Cast an Eye, Behold in Prison Here Lie, Bestow You in Charety.” The final phrase struck a chord with me, because I think he refers to moral charity or compassion. Even today, we equate debt with profligacy and fecklessness, yet my experience is that people commonly borrow money to make up the shortfall for necessary expenses when there is no alternative. I was brought up to avoid debt, but I had no choice when I was nursing my mother through her terminal illness at home. I borrowed because I could not earn money to cover household expenses when she lived a year longer than the doctors predicted, and then I borrowed more when I could not make the repayments. It was a hollow lonely feeling to fill in the lies upon the second online loan application, just to ensure enough money to last out until she died, when I was able to sell our house and pay it off. So you will understand why I feel personal sympathy with the debtors who inhabited this cell. Every one will have had a reason and story. I wish I could speak with Edward Burk, Iohn Knolle, William Thomas, Edward Murphy, Thomas Lynch, Richard Phelps, James Parkinson, Edward Stockley and the unnamed others to discover how they got here. In spite of the melancholy atmosphere, it gave me great pleasure to examine their drawings incised upon the walls. Here in this dark smelly cell, the prisoners created totems, both to represent their own identities and to recall the commonplace sights of the exterior world. There are tall ships with all the rigging accurately observed, doves, trees, a Scots thistle, a gun, anchors and all manner of brick buildings. I could distinguish a church with a steeple, several taverns with suspended signs, and terraces stretching along the whole wall, not unlike the old houses in Spitalfields. I shall carry in my mind these modest images upon the walls of the cell from Wellclose Sq for a long time, created by those denied the familiar wonders that fill our days. 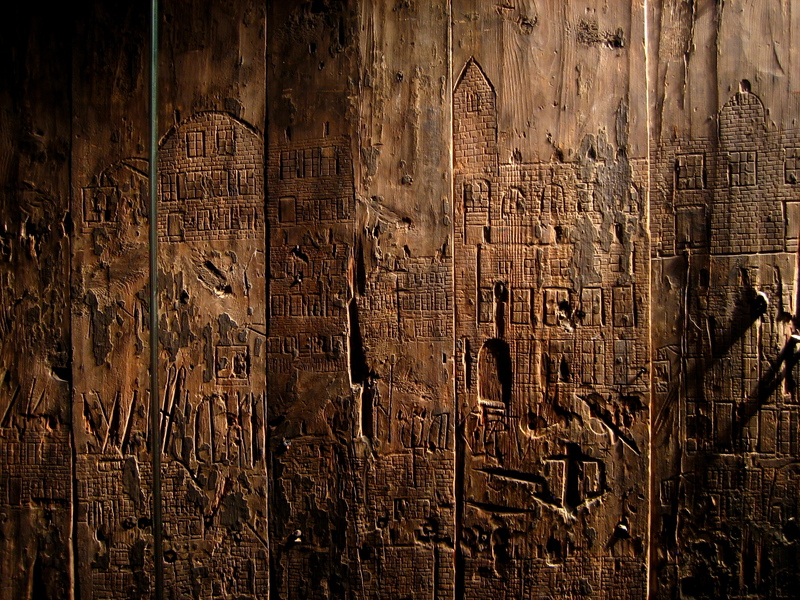 Shut away from life in an underground cell, they carved these intense bare images to evoke the whole world. Now they have gone and everyone they loved has gone, and their entire world has gone generations ago, and we shall never know who they were, yet because of their graffiti we know that they were human and they lived. Lovely art, and I like it better than the work of Bank$y. As the gentle author explained this was a private prison. These holding areas ?were within the judicial system I expect for short term local debtors, operated because the main prison was over crowed; that’s my theory. We are now operating a private prison system in the UK. Oak plank liners for the cells were very strong and tough that’s why they survived also difficult for a break out. At this time oak timber was more plentiful. Another fine piece from the pen of no name just a gentle author, keep writing don’t stop. Also thanks to the Mus of London for their set up must be worth a visit. John at his best I hope. What a poignant tribute. If I remember rightly, the Museum of London also has the doors to Newgate Prison from the 18th century, too. Beneath the Viaduct Tavern in Newgate Street some of the wretched cells still exist and, if you ask nicely, the staff will show you for free. Apparently it’s popular with ghost hunters. A touching reminder that our Troubles of today didn’t begin Today. Thanks for putting us in touch with our emotions and their lives. A wonderful post. Most appreciated. What a great opportunity this is to see the life of regular people from the past – I appreciate your thoughtful approach. The writing on these walls deserve to be shared. If the gentle Author will allow me to link to another website, Tower Hamlets History Online, there is a piece there written about the history of Wellclose square and the prison mentioned in this post and the legend of how it also came to be known as “the sly house”. An interesting corner of the East End, for sure. Not that there is much left there to hint at the rich history associated with the place for all was swept away in post war “slum” clearance. He continues to describe his life inside and how he managed to secure his release through his tailoring skills. But he said that many others languished for years if they were unable to raise the money to pay off their creditors and if the creditors were hard-hearted enough to allow them to rot in jail. A rotten system! Thank you for this post. Those poor devils. I discovered through searching on the internet only last night that one of my forebears was imprisoned for debts in 1823. His son went on to become an accountant and fathered 16 children, so his finances must have been stretched too. @ The Gentle Author: A lovely piece. I have more hope than you that we can find out about the lives of the prisoners – I’m writing a PhD on the subject. But having done some cursory searching, I cannot find any of the people you name. @ Peter Holford: your 2xGreat Uncle’s memoir sounds like it is a very valuable piece of social history. It’s very difficult to find the individual life stories of imprisoned debtors. Have you published it, or given a copy to an archive? If I had lived then, I too would have been in the debtors prison. carry the stigma of the past , it still leaves it’s mark. I found this piece strangely cathartic, thank you.